Lately I seem to be a little obsessed with quinoa. I know it's trendy now but I wasn't such a fan the first time I tried it a couple of years ago. Somehow it grew on me, though, and now I'm constantly thinking up new ways to prepare it. I'll be considering making a salad or a pilaf or some other traditional dish and I'll think to myself - hey, why don't I put some quinoa in there? Oh, well. Considering how healthy quinoa is, I'm far better off with it than, say, my cheesecake obsession. Last week I made a batch of tahini sauce, one of my absolute most favorite savory foods. I like it with lots of lemon and garlic and, ideally, I would just have a big bowl of it and lots of pita bread to scoop it up. Hmm...not such a good idea, maybe? I also love dipping cucumber slices into it which is healthier but hardly a meal. So I decided to add some chickpeas to the cucumbers and tahini and it tasted really good. And then my quinoa obsessed brain thought - I wonder if quinoa would taste good with this? Why, yes, yes it does! Since the chickpeas and tahini are middle eastern flavors, I added some cilantro. Yes, we think of it as a Mexican herb but it's actually quite common in middle eastern cuisine as well. But parsley or even chives would be fine as well. Brian would probably see this as a fine lunch salad but, when I'm on my own for dinner, a big bowl of this suits me just fine. Enjoy! Make the dressing by combining all the ingredients in a bowl and whisking until thoroughly combined. 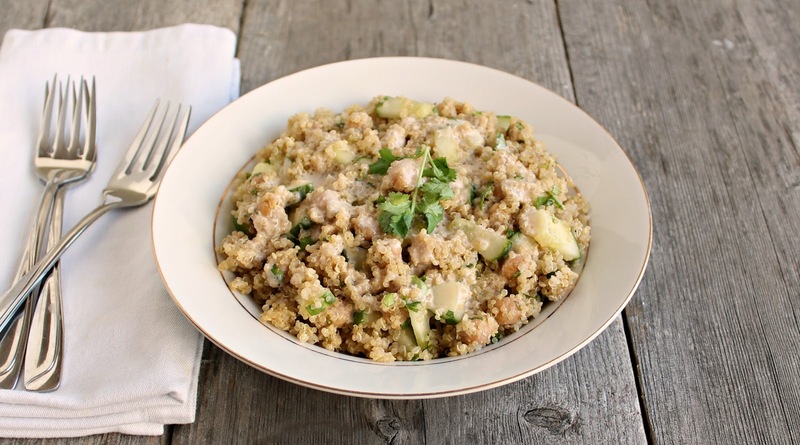 Cook the quinoa and allow to cool slightly before adding the chickpeas, cucumber, cilantro and dressing. Serve at room temperature. Makes 2 servings. I'm obsessed with quinoa lately! I cannot wait to try this! I was on such a quinoa kick a while ago, I had to take a time out from it. Luckily, my time out has ended and I just bought a big bag of red quinoa. These flavors are lovely! I can see this becoming a favorite in our house! This is sounding like a perfect summer salad. Also great dressing, I need something to use my big container of tahini paste for. Sounds like a great dish for a hot summer day! I'm with you!! I have an admitted love affair with quinoa... I can't get enough!! And you made your own tahini??! I'm totally impressed. This salad has my name all over it. Love the bright lemon and the chickpeas. I see this as a lunch in my future. My girlfriend eats quiona every day for lunch like oatmeal...so I think this delectable salad is fair game for 3 meals a day. Unless you're my husband...I think you could guess his view :/ Just more for me. 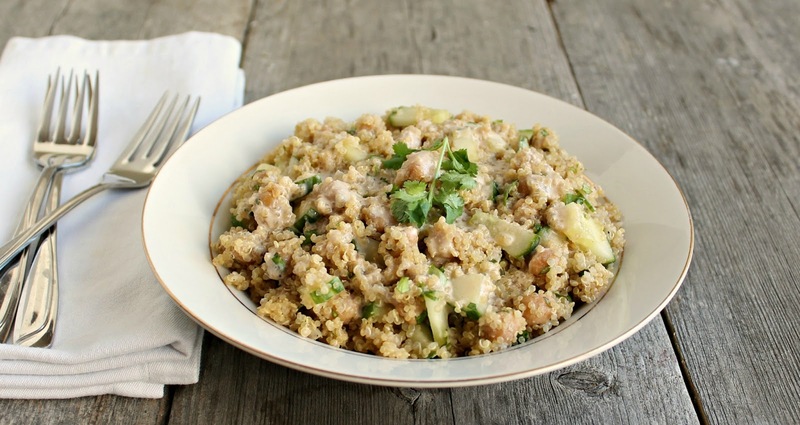 I love quinoa because you can do so many different things with it! This looks so good! I love quinoa and not that hubby is gone for a few months I can eat it all the time. Thanks for sharing on Foodie Friends Friday. Love the flavors in this salad. I'm always looking for new things to do with tahini. Thanks for sharing on Thursdays Treasures. This looks great! My only question is, if I use the tahini I have on hand, do I just use that for the dressing or what do I need to mix it with? Hi Laura - If what you have is a pre-made tahini dressing, you can use it as it is although you might want to spruce it up with a touch of lemon. On the other hand, if what you have is unprepared sesame paste, then go ahead and make the tahini sauce using my recipe. I hope that helps. Torwen - thank you very much for letting me know! I will take action against them.